This card is for the Winnie & Water Share the Love featuring Essentials by Ellen Day 3: Background Building Challenge. I stamped a series of solid image roses from Winnie & Walter's The Big, the Bold and Extras Stamp Set in two shades of yellow onto a white background panel. I then overstamped the outlined image with a pale green. I filled in large white areas with the small, solid leaf stamp in that same set, as well as some dots in the green and yellow shades. 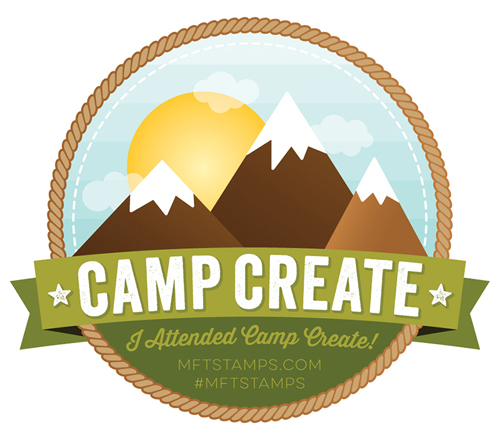 I then stamped the solid image banner in yellow and the outline banner in green, and added a sentiment from Essentials by Ellen 12 Days Companion Greeting Stamp Set onto the outlined banner image. These were both fussy cut and layered. I adhered the panel to a white card base, but before doing so, I inked up 3/4" of the right side of the card with yellow ink and then added a strip of inked green paper. 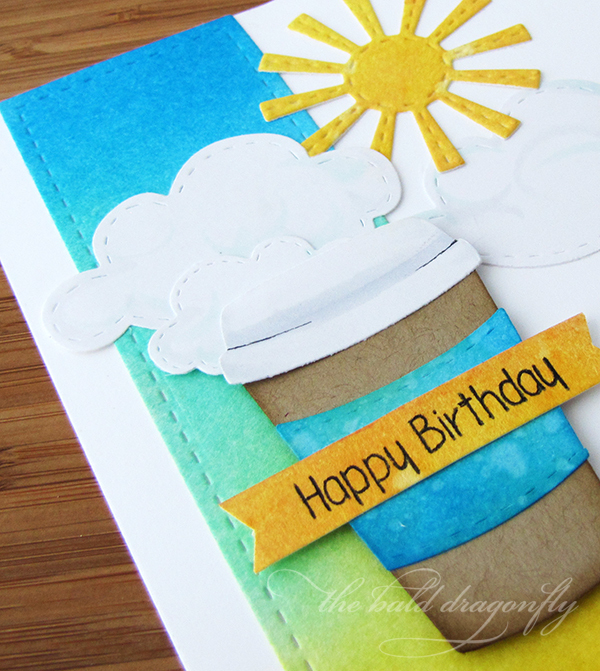 I adhered the banner sentiment to the card with foam adhesive on the left side and regular adhesive on the right side. Pretty happy with the way this one turned out. I wasn't too sure as I was making all the elements separately, but I didn't give up. And, I tried new things too, which is always fun! I'm back again this afternoon with a card for the Winnie & Walter Share the Love Featuring Essentials by Ellen Day 2: Sentimental Challenge. 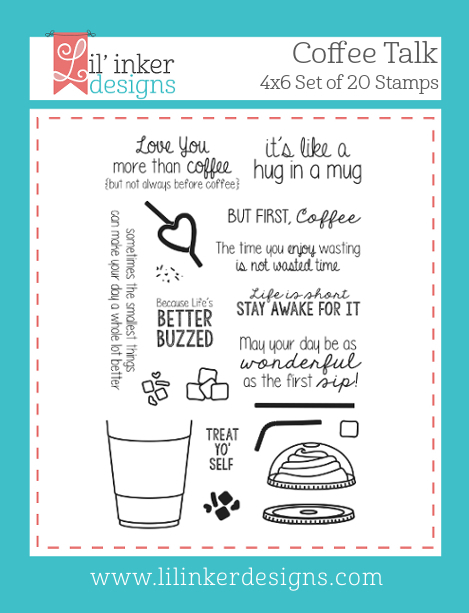 I started by marking out a light, penciled grid onto vanilla cardstock, with each block a hare larger than the "Merci" stamp from the Essentials by Ellen 12 Days Companion Greetings Stamp Set. 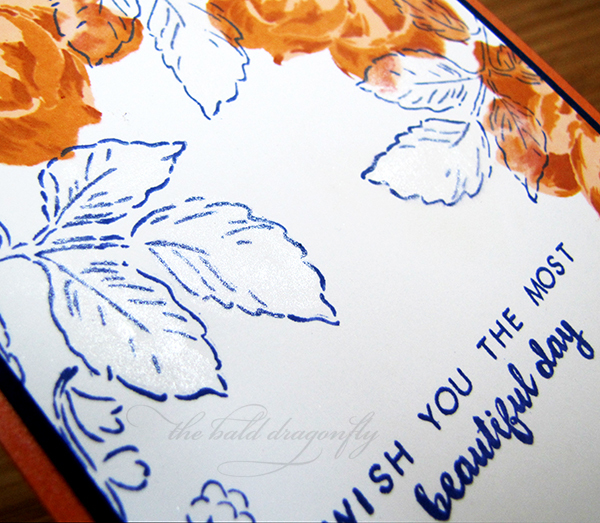 I stamped the sentiment in peach ink in each block, having left two blocks open in the bottom right corner. I then erased the pencil guides and inked the edges. Then I stamped in green ink the solid and outlined leaf images from Winnie & Walter's The Big, the Bold and Extras Stamp Set, fussy cut them out and adhered them to the left side of the unstamped area. I added a few bronze rhinestones for the berries. I finished the card by stamping the "Merci" sentiment in toffee ink in the remaining open area. 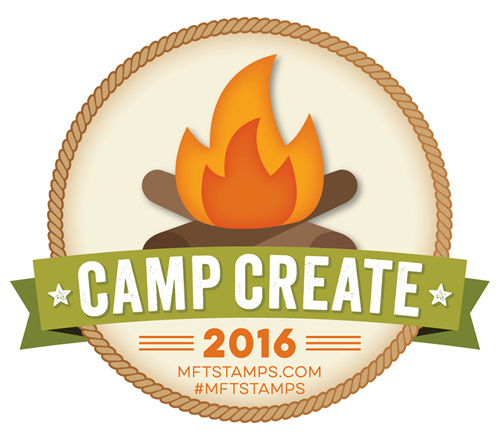 I have one more card finished for Day 3, and hope to get the other two cards made. 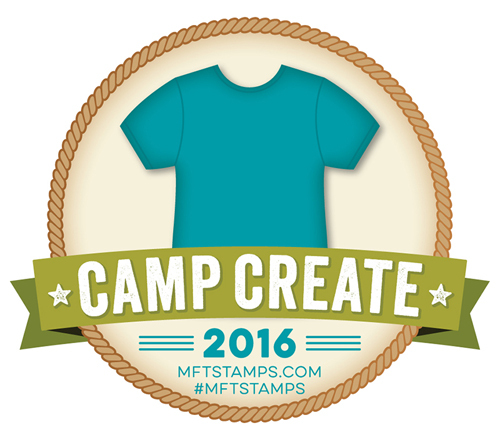 Have you joined along in this fun challenge? 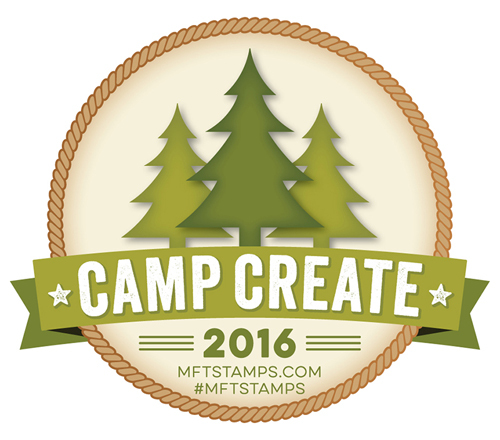 I only have one stamp from each of these companies and it has been rather fun to see the different cards I have made with just these two set. I stamped with abandon with these, and it was liberating! 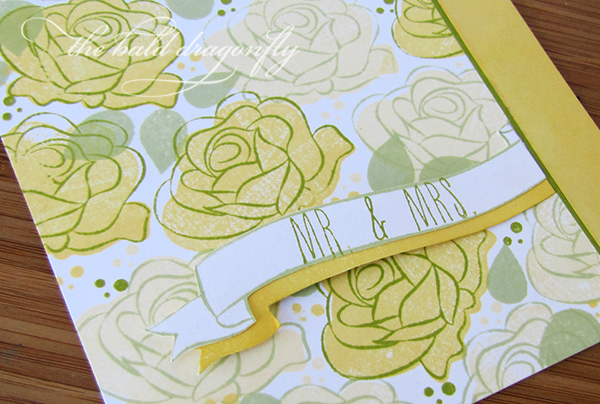 I'm playing along with Winnie & Walter's Share the Love featuring Essentials by Ellen Day One: Florals. 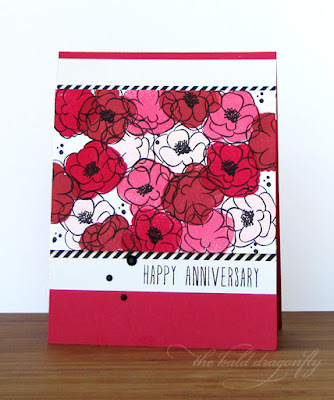 Our challenge was to create something with florals so I stamped one of the solid image blooms from The Big, The Bold and Extras in light pink, bright pink, red and crimson onto a white card panel. I then over-stamped the blooms with the lined bloom stamp image from the same set, and finished the panel with some of the stamen details and a series of dots. I mounted this panel onto a dark pink card base with foam adhesive and then added a border of a black and white strip and white cardstock strip. 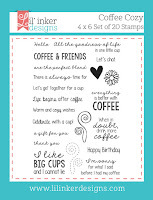 I stamped a sentiment from Essentials by Ellen 12 Days Companion Greetings Stamp Set. I finished the card with a set of three black rhinestones. My little one's last day of baseball was tonight. I am so proud of him, he improved by leaps and bounds and I could tell he was having fun. You know it was a good season when they are already talking about next year's baseball games! 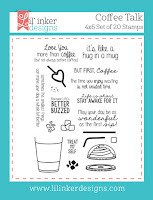 There is an fabulously fun inspiration image up for the Essentials by Ellen June Pin-Sights Challenge! Isn't is funny how one can be inspired? 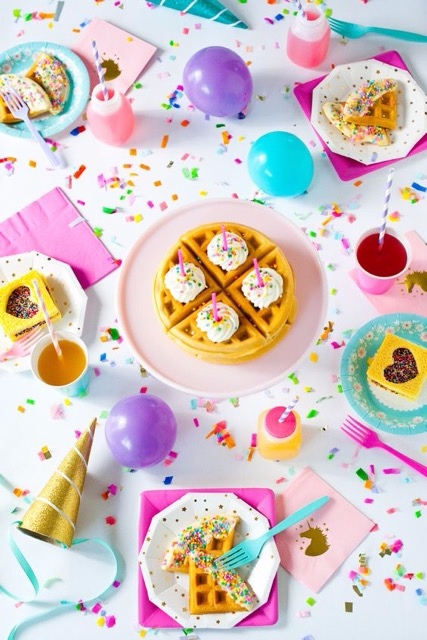 I saw the waffles in this picture and immediately thought "chicken and waffles". I've never had this combo myself, but I am sure it tastes good. I decided to keep my card clean and simple, as is the norm with my cards lately. I pulled out an older Lawn Fawn set, Critters on the Farm and colored and fussy cut a chicken and some chicks. 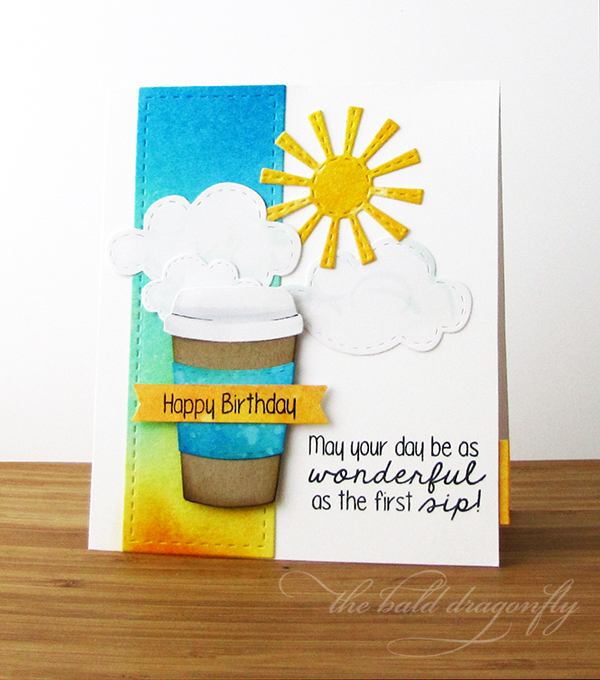 I added some yellow splatters to a white cardbase and stamped a sentiment from the Essentials by Ellen, 12 Days Companion Greetings Stamp Set. 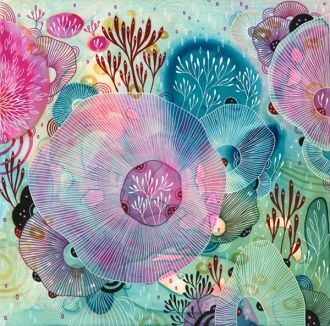 I created my own patterned paper by running strips of copic colored lines (to match the colors from the inspiration picture) onto a piece of glossy cardstock. 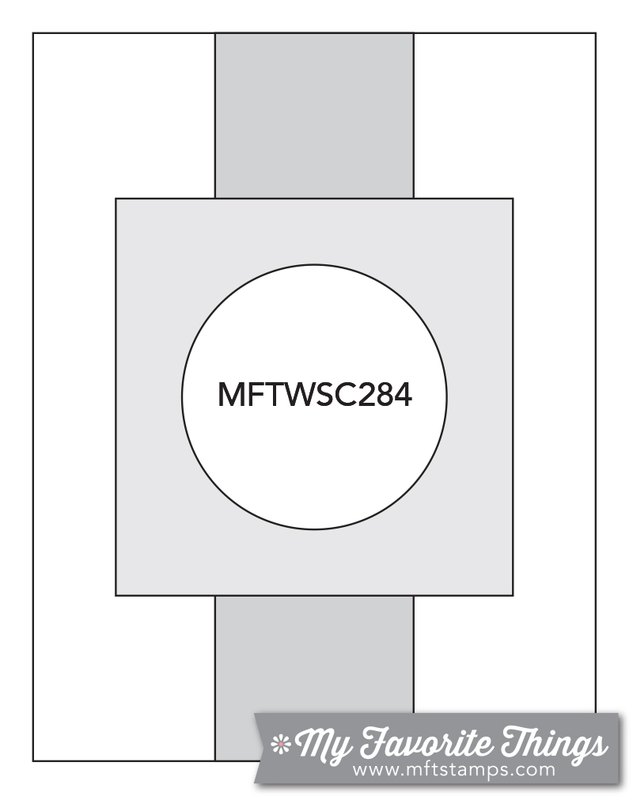 I then adhered the strip to the cardbase, adding a thin strip of black cardstock as well. 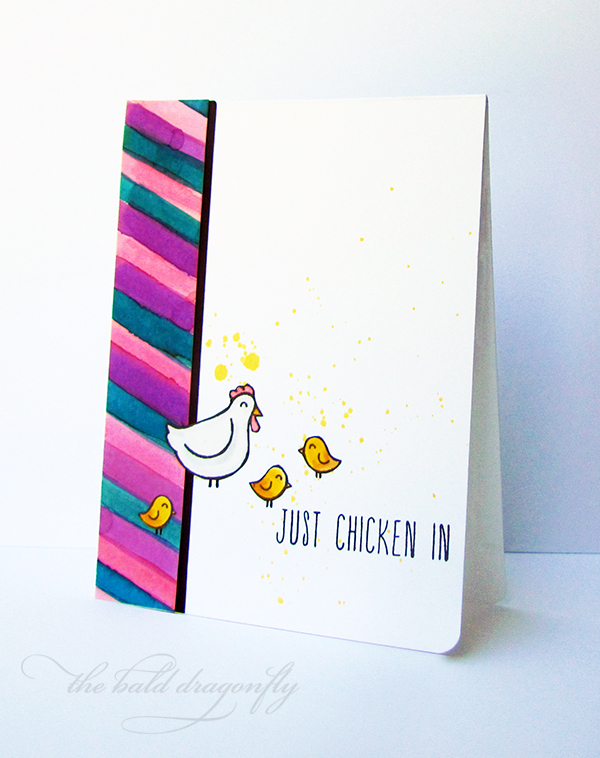 I finished the card by adhering the hen and chicks onto the card. Reef Flowers. That is the name of this card. Do you name your cards? 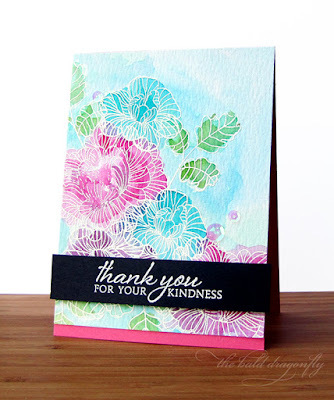 This card was inspired by the beautiful image for the June Paptertrey Ink June Blog Hop. Isn't it just beautiful?! 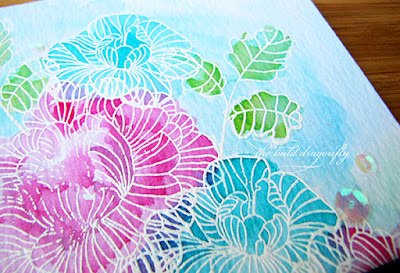 I attempted to replicate the style and colors of the inspiration piece, so once again, I pulled out the PTI In Bloom Stamp Set. I first put a wash of light blue and green inks onto some white distress watercolor paper. I then heat embossed in white the blooms and leaves, and applied a loose, but vibrant color wash over the images. I added the watercolored panel onto a bright pink card base, flush to the top and then trimmed the sides. I finished the card by heat embossing in white a sentiment from Iconic Images onto black paper, adding it to the card with dimensional adhesive. The sides of the sentiment panel overhang just a tad. Ooh, and then lastly, I added a few iridescent sequins too, they change colors from pink to blue in the light and I thought that they fit perfectly with the blooms. 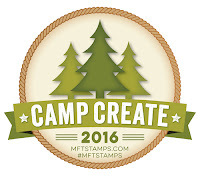 This is my last post for the My Favorite Things Stamps Camp Create. The last challenge is Spectacular Shakers! 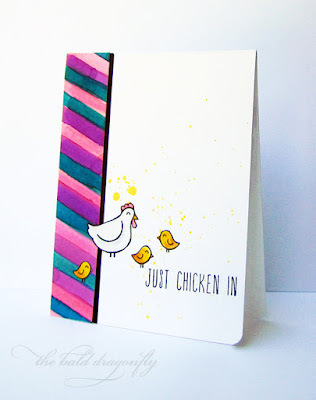 Although my shaker area isn't too large, I still love this sweet shaker card! I think it is awesome that almost any simple image can become an area for a shaker, so I had to try it out with the balloon. 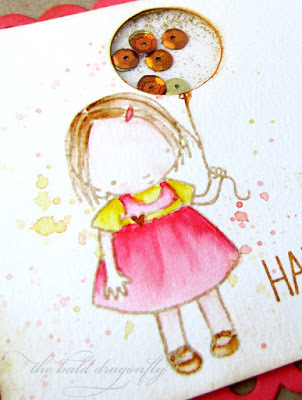 I started with an older, retired image from the Pure Innocence My Balloon Stamp Set and watercolored her in with Zig Markers. I followed suite with some customary watercolor splatters and then added a sentiment from Adorable Elephants. I then die cut a circle where the balloon image was to use as the shaker part of my card. I assembled the shaker portion by backing the open balloon area with acetate, adding sequins and glitter in the area not backed with dimensional foam and affixing the panel to a kraft card base. I then bordered the panel with a decorative pink edge. So simple, but so sweet I think! 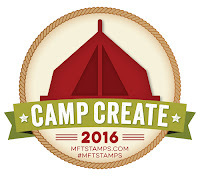 I really enjoyed playing in all the Camp Create Challenges, I was able to try new to me techniques and that is awesome for an "old" stamper like me. 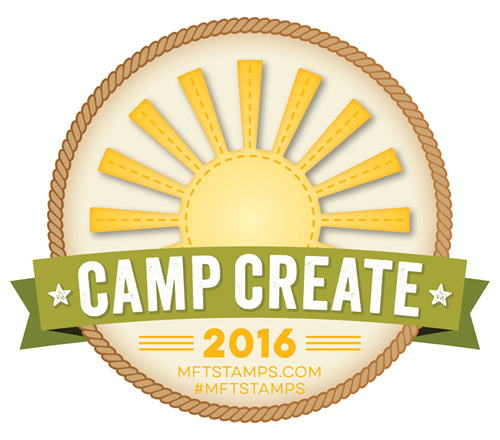 I'm back again with the fourth challenge for My Favorite Things Stamps Camp Create. 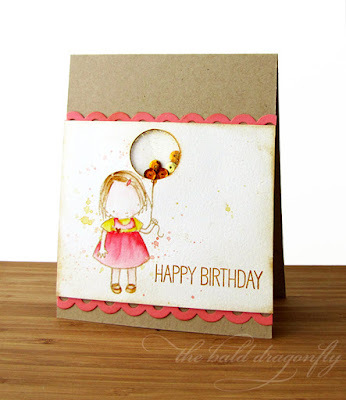 Today's card features the partial die-cutting technique for the Delightful Die-Cutting Challenge. I really, really enjoyed making my cards for this challenge and how cute and simple they turned out (probably because I was stretched for time and didn't think too much about how the end result would look)! I started this card by utilizing the partial die-cutting technique on the yellow panel. 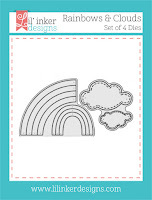 Then I die cut two rows of grass from the Fresh Cut Dienamics Die and die cut a cloud panel using Lil' Inker Designs Border Builders Die Set. All the edges were slightly inked with a coordinating color (for the white I used a light gray). I adhered a piece of light blue cardstock onto a white card base, then the white cloud panel, the yellow "sun" panel, and finished with two rows of grass. 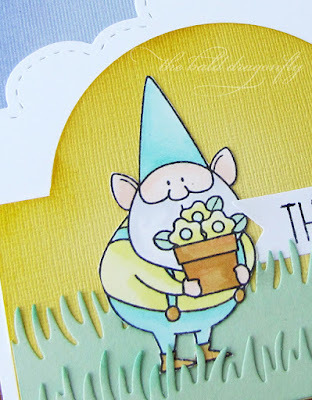 I then stamped, colored and fussy cut a cute little gnome from You Gnome Me and he was attached to the card between the two grass layers. I stamped a sentiment from Adorable Elephants onto a white strip of cardstock and adhered that to the card to finish it off. 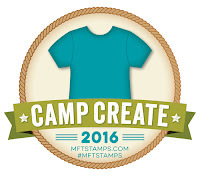 My Favorite Things Stamps hosted a fun challenge series, Camp Create. Today's card is for the third challenge, Watercolor Wonder. Seriously, so glad I tried this. I feel like a true artist! This turned out cuter than I could have imagined. 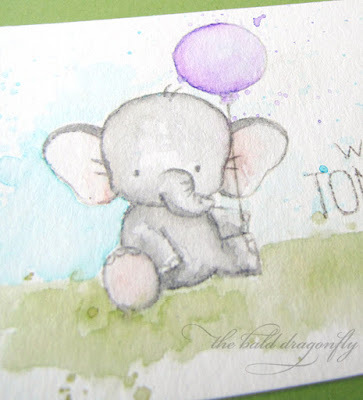 I stamped one of the elephants from Adorable Elephants onto watercolored paper with light gray ink, then watercolored him in with zig markers and water. I then added a wash of green for the grass and blue for the sky, and of course, had to add some splatters in each color. 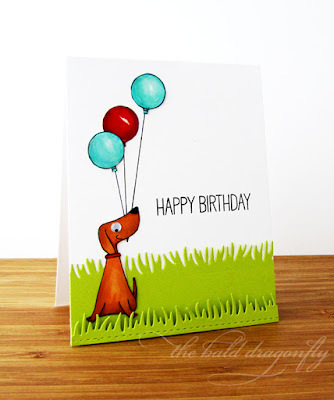 I then decided he needed a balloon, so I stamped that in gray as well and watercolored it in purple. 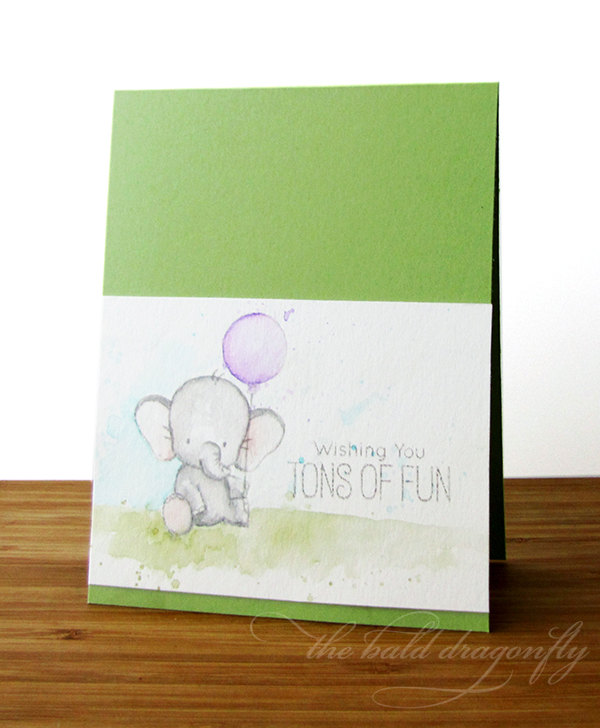 I then stamped the sentiment, also from Adorable Elephants. 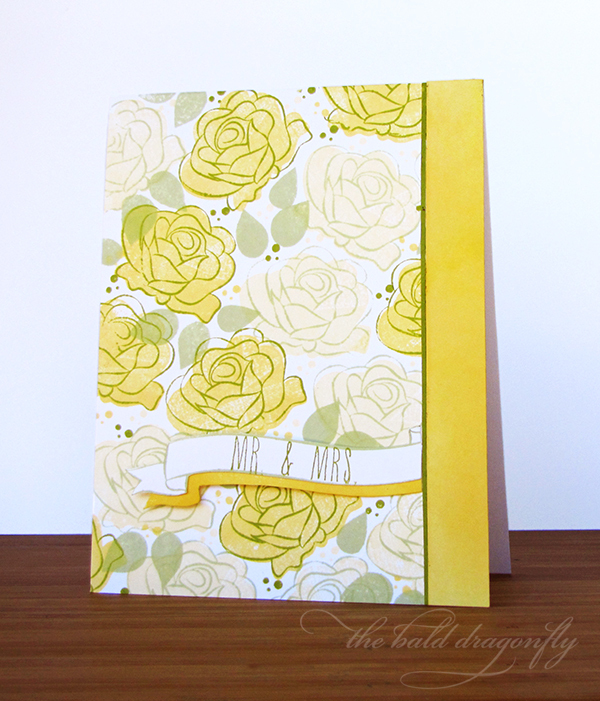 I went simple with the card so the watercolored panel was affixed to a light green card base. I started by die cutting two rows of grass with the Fresh Cut Dienamics Die, adhering each to a white card base that had been stamped with a sentiment from Adorable Elephants. The bottom strip of grass was adhered with dimensional adhesive. I then colored and fussy cut a puppy from You Make My Tail Wag, adding a google eye. Before adhering the puppy to the card, I stamped, colored and fussy cut three balloons from Adorable Elephants and adhered them to the card. 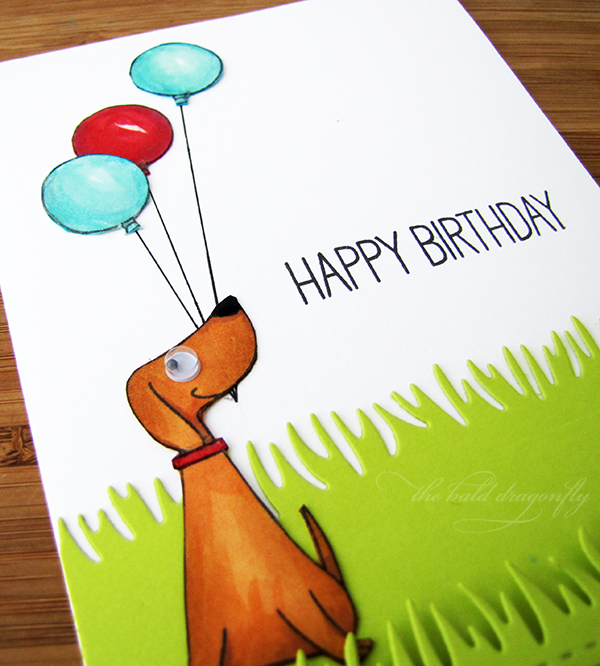 I drew in the strings, and then affixed the dog to the card. 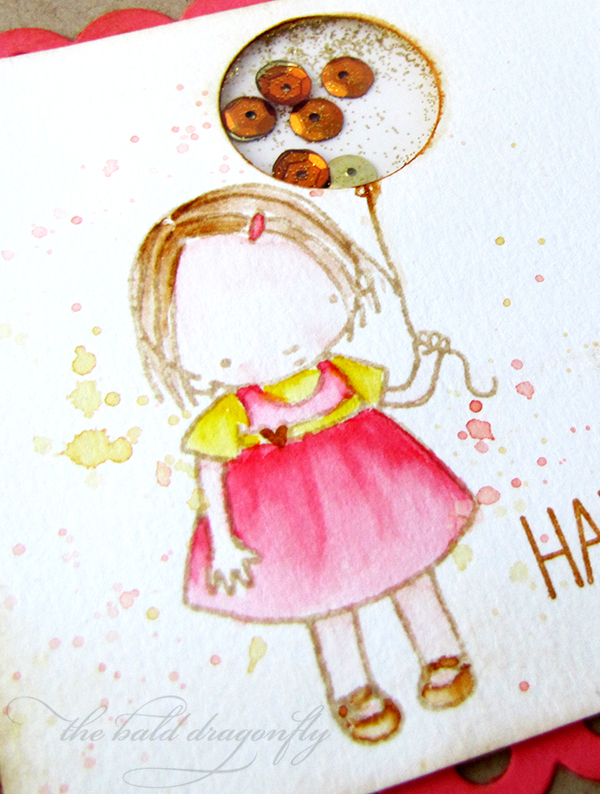 For a finished touch, I covered each of the balloons with glossy accents. I'm thinking that the eyes will stay out on my desk, and they will make more appearances. 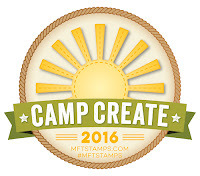 My Favorite Things Stamps hosted a fun challenge series, Camp Create. The first challenge was Glitzy Glitter. 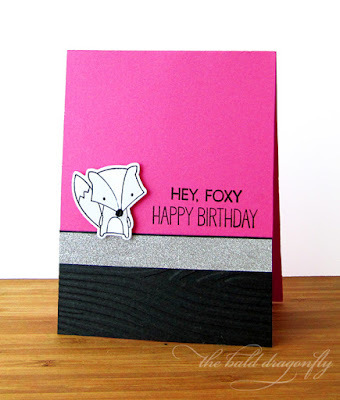 I kept this card pretty simple, by adhering a wood embossed black cardstock panel to a portion of a hot pink card base. I then affixed some silver glitter tape to the card, and a stamped a sentiment from Forest Friends and Adorable Elephants. 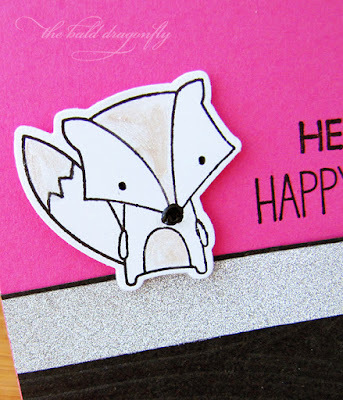 I then stamped and die cut the fox from Forest Friends (I think it is a fox, but perhaps it was a skunk, not sure, but for today she's a fox!) and added a bit of black enamel accents to the nose (it went a bit wonky!) and then some perfect pearls to the tummy, head and tail for added glitz and glam. The challenges last week were quite fun for Camp Create. I completed all of them so will be showcasing them in a few posts. I must admit that I haven't tried iced coffee, but do still enjoy the nice cup(s) of hot coffee on summer mornings. 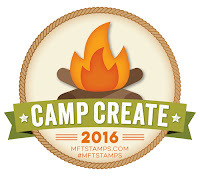 I'm participating in the 2016 Summer Coffee Lover's Blog Hop. The Spring Hop was a ton of fun, so I knew I wanted to participate again. 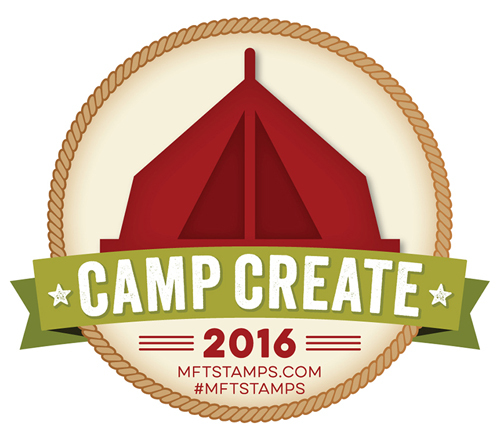 Looking forward to seeing all the amazing coffee creations linked up. 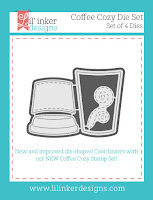 I started my Summer Coffee Card by die cutting from kraft and white cardstock a mug, sleeve and cover from Lil' Inker Designs Coffee Cozy Die Set. I inked up and did some simple coloring on the respective pieces, and affixed them to an inked gradient panel that had been die cut with LID's Stitched Mats: Long and Skinny Rectangles. 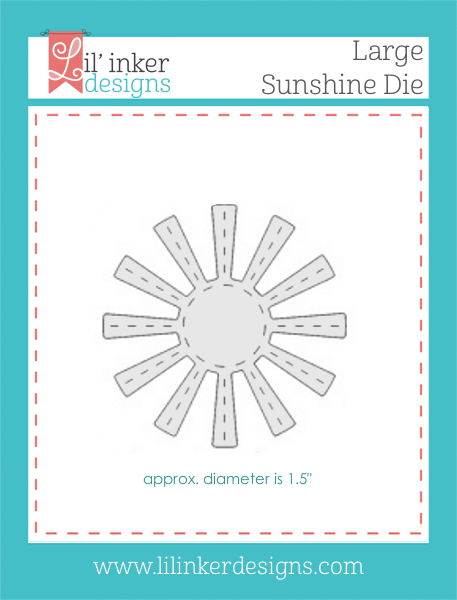 I then die cut a sun and clouds from Lil' Inker Designs Large Sunshine Die and Rainbow and Clouds Die Set, and then stamped a birthday sentiment from the Coffee Cozy Stamp Set onto an inked banner. I affixed this over the coffee sleeve. 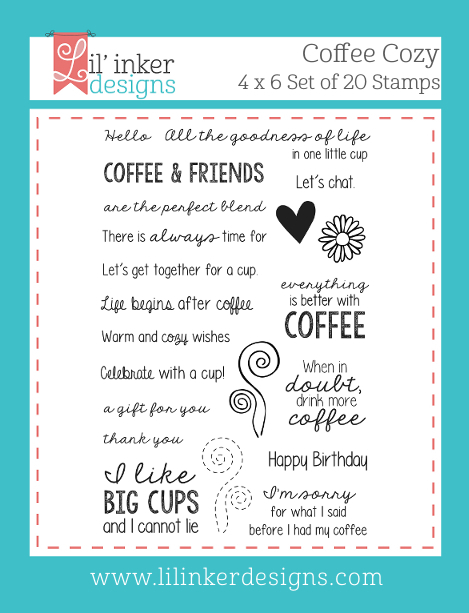 I finished the card by stamping a sentiment from LID's Coffee Talk Stamp Set onto the white card base and added an orange decorative tab to the right of the sentiment. I'm also posting this to my Instagram, I welcome new followers! 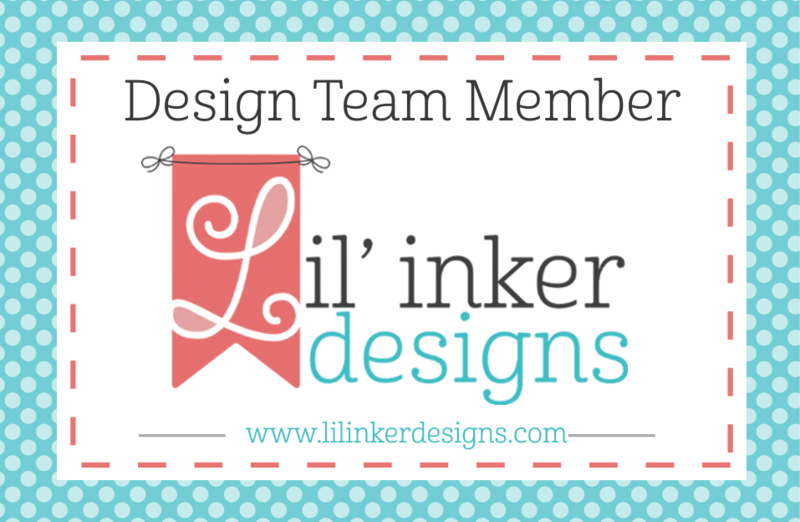 Lil' Inker Designs is sponsor of the Summer Coffee Lover's Blog Hop, and they have amazing coffee products! 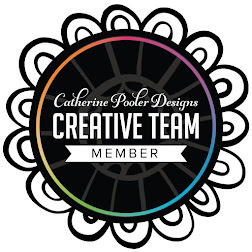 *Affiliate Links Used in today's post...but I truly love this company! My younger child is fascinated by shaker cards, how they are made, how they look, what they sound like. I've asked him a couple of times if he'd like to make one but he shakes his head. "I'll just see what you come up with...." is usually his response. I made this shaker card with him in mind, along with the Craftin' Desert Diva's Masculine Linky Party and the Simon Says Stamp Wednesday Challenge: Animal Kingdom in mind. 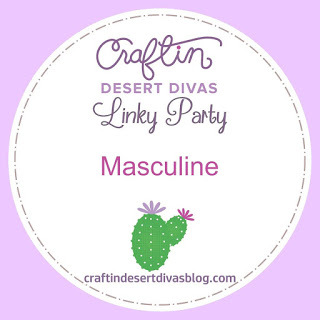 (I used masculine colors and images.) 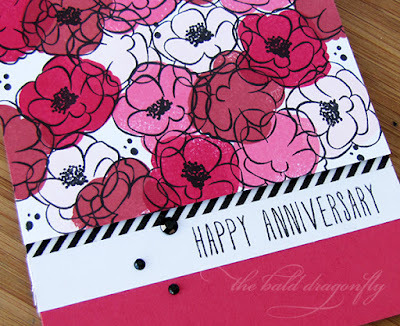 I started with a kraft card base that was embossed with Lil' Inker Designs Cover Up Die: Stitched Woodgrain and stamped with a Paper Smooches sentiment. I then die cut a frame with Lil' Inker Designs Instant Camera Die to frame the cute little critter from Craftin' Desert Diva's Peek-A-Boo Animals Stamp Set. 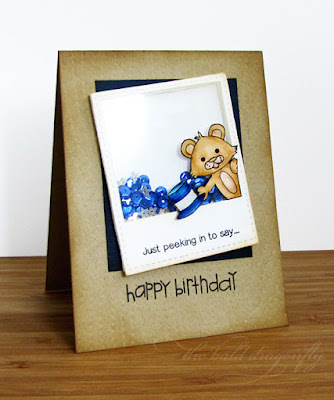 I also stamped a coordinating sentiment from this set onto the bottom part of the frame. The bear was colored with zigs and fussy cut, I also added the top hat. I created the shaker part of the shaker card (filling with blue sequins and silver stars). The bear and hat are in front of the acetate. The shaker was then adhered at an angle onto a blue panel and they were both adhered to the card base. 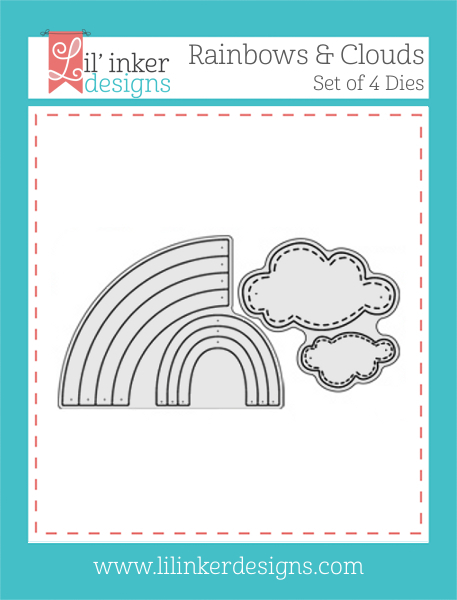 I wanted to use the stamps included in this set that haven't seen any ink yet for Anna's CASometry Challenge 2: Make Five: Stage 4. I decided to capitalize on my indecision and arranged the leaf/feather stamps in a circular arrangement, and then colored them in from a gradient of yellow, green and blue. 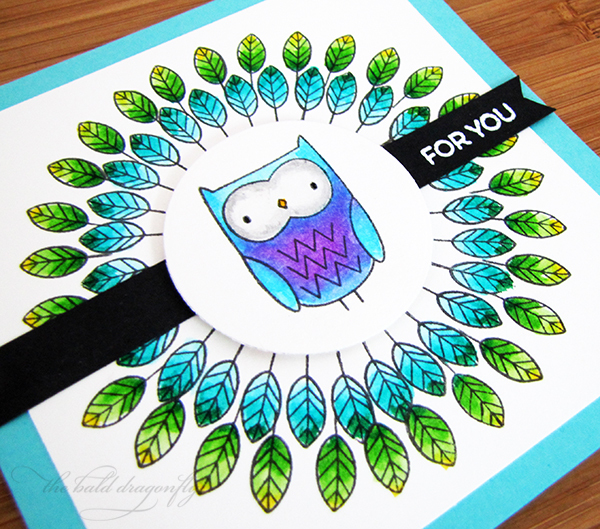 I then stamped an owl onto a die cut circle panel and then colored him with a blue/purple gradient. I mounted the panel over the leaves with foam adhesive and then onto a blue card base. I finished the card with a black cardstock, white heat embossed sentiment from Birthday Bears. 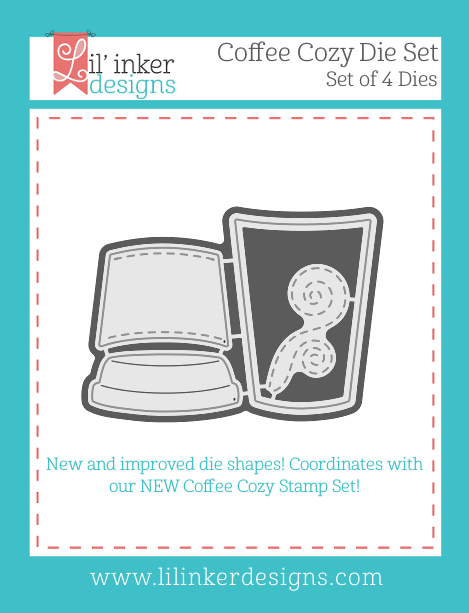 This has been a fun challenge, I'm already thinking of the fifth card I can make with this stamp set! So happy that I had some buds on my peony bush this year, as I received some of my grandmother's bush a couple of years back. Slow start to them, but I guess it takes awhile for them to be established in a new home. 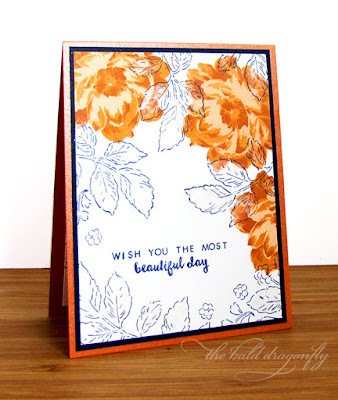 I saw the challenge colors at The Heart Desires and really wanted to stamp the flowers from Altenew's Beautiful Day in two orange tones, I am not sure if these blooms are supposed to be orange? I then stamped leaves in a navy blue ink, and I know that there aren't any of those in real life. That is the nice thing about crafting, you can create what fancies you. To add a bit more interest to the card, I covered the leaves with some sparkle. Although I feel as though the sentiment is in an awkward location, I hemmed and hawed over the design of the card long enough and called it good. Sometimes one just has to move on, right? I had a little time to myself today so of course I opted to make a card instead of clean the house. That is the natural thing to do, right?! 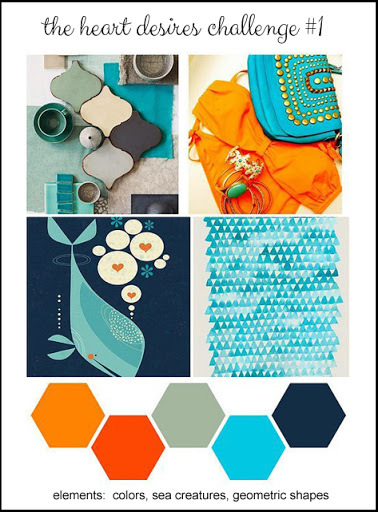 I'm playing along with the current My Favorite Things Sketch Challenge #284 and their current Color Challenge #47. I started by inking and stamping the sitting gnome from You Gnome Me, then I colored him with Zigs. I added white foam paint for his beard. He was nested in front and in back of some grass cut from the Fresh Cut Grass Die-Namics. 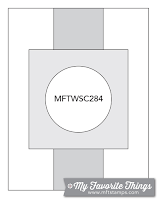 Lots of dimension with this little detail! 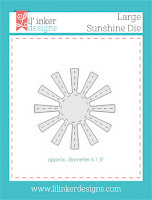 I die cut a circle enclosed in a square from ivory cardstock a from series of Lil' Inker Designs dies, and then mounted this to an ivory card base that had been embossed with Lil' Inker Designs Cover-Up Die: Stitched Woodgrain. 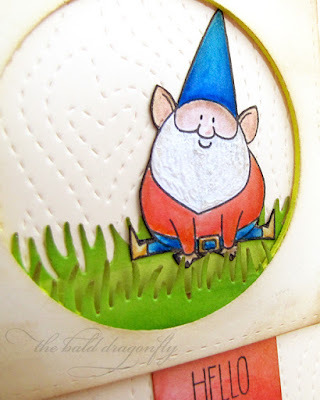 (I thought that cute little heart in the embossed area complimented the cute little gnome quite nicely.) 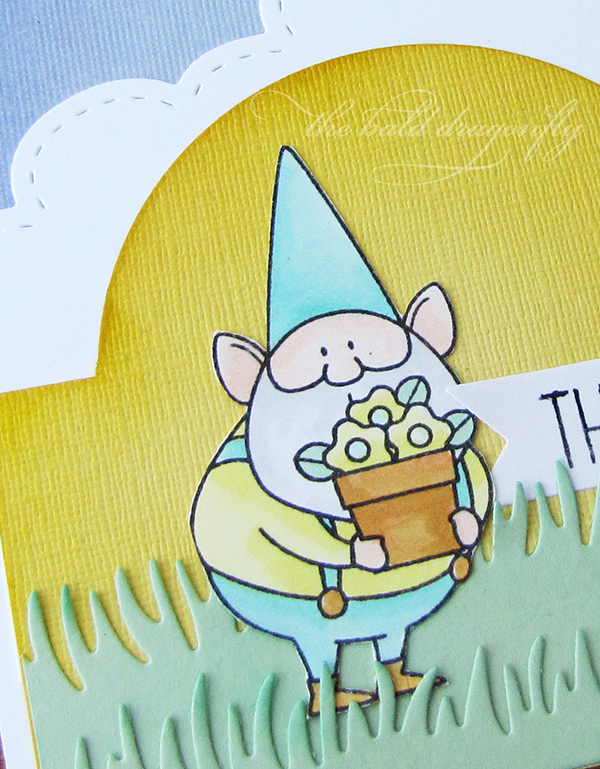 I finished the card with a sentiment strip inked in the sam color as the gnome's shirt, and added a sentiment.